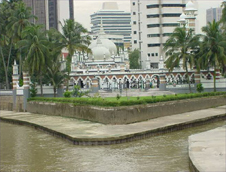 Jamek Mosque Kuala Lumpur - Otherwise known as Friday Mosque or Masjid Jamek among the locals, is a historic structure located at the confluence of the Sungei Klang and the Sungei Gombak rivers. Designed by Arthur Benison Hubback and was officially opened by the then Sultan of Selangor in 1909, it is a tranquil area set among shady palm trees. Two years after construction was completed. 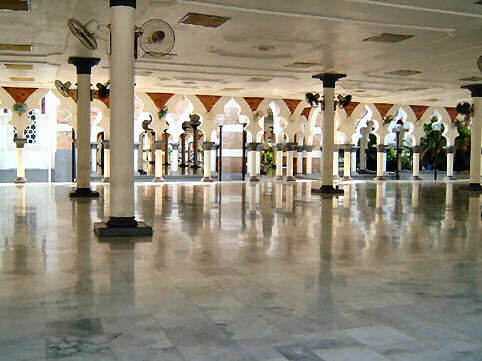 The mosque was built on the first Malay burial ground in the city. 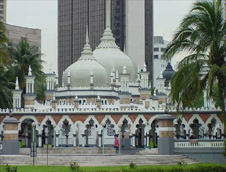 Before the national mosque, Masjid Negara, was opened in 1965, Masjid Jamek served as Kuala Lumpur's main mosque. p>This structure has the resemblance in design with the Sultan Abdul Samad Building which was also designed by the same architect. The word "Jamek" is derived from the Arabic language which means a place where the people congregate for religious purposes. The mosque has 2 main towers, other smaller towers and 3 domes. The central dome is located where the prayer hall is and is 21.3m or 70 feet high. 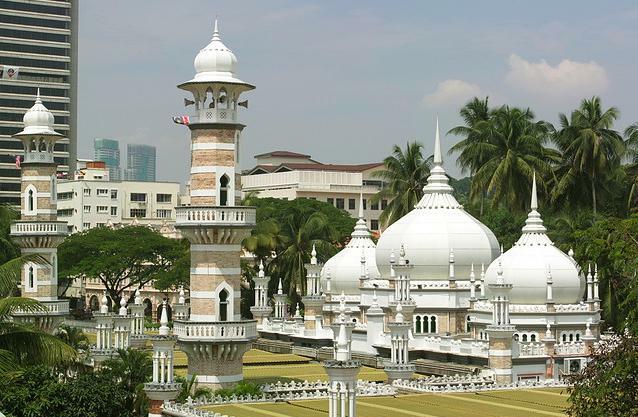 At the corners are two red and white striped minarets with a height of 26.8m or 88 feet. The structure stands up in the midsts of modern and tall skyline of Kuala Lumpur. To get there, simply take the PUTRA or START LRT and stop at the Masjid Jamek Station. The mosque is just a stone's throw away from the station.